The Large Magellanic Cloud and the Small Magellanic Cloud are two dwarf galaxies satellite of the Milky Way and consequently orbit it. At the same time, the two Clouds orbit each other so that the combination of gravitational forces creates complex movements. Among the results there’s a sort of cosmic tug-of-war between the two Clouds and at one point, perhaps one if not two billion years ago, one of them pulled a considerable amount of gas from the other that formed the Leading Arm of the Magellanic Stream but which of the two galaxies suffered that loss? The question has been debated by astronomers but now a team of researchers led by Andrew Fox of the Space Telescope Science Institute offered an answer. In 2013 a previous research concerning the Magellanic Stream recognized that it was made up of gas coming from both Magellanic Clouds. This time the research concerns its counterpart, the Leading Arm, which the Milky Way is already slowly devouring. This type of accretion phenomenon is probably common in the case of galaxies with satellites but gas emissions are difficult to observe in the details needed from millions if not billions of light years away. The Leading Arm is close in astronomical terms and the Hubble Space Telescope can observe the area at ultraviolet but very distant objects can still be useful. In particular, quasars, active nuclei of galaxies that can be very far away, are so bright that their emissions filtered by the Leading Arm’s gas can provide information on its composition. The Hubble Space Telescope’ Cosmic Origins Spectrograph, with its sensitivity in the ultraviolet spectrum, allowed to measure the absorption at those frequencies by the oxygen and sulfur present in the Leading Arm. These two elements represent good indicators of how many heavy elements are present in the gas. The measurements of the hydrogen were added, conducted by the National Science Foundation’s Robert C. Byrd Green Bank Telescope and a number of radio telescopes. 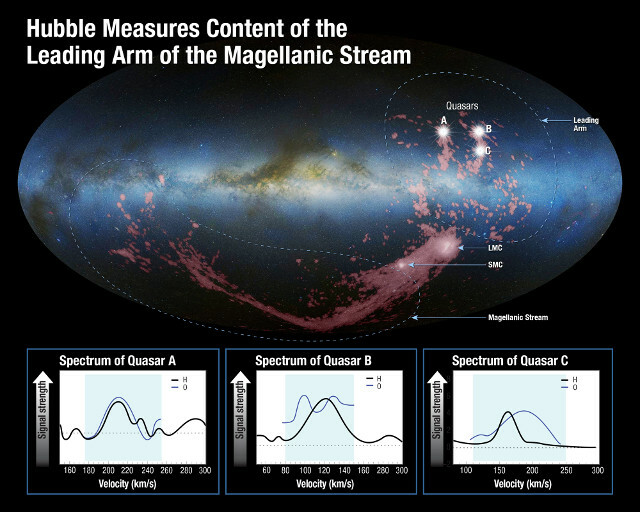 The image (D. Nidever et al., NRAO/AUI/NSF and A. Mellinger, Leiden-Argentine-Bonn (LAB) Survey, Parkes Observatory, Westerbork Observatory, Arecibo Observatory, and A. Feild (STScI)) shows the gas between the Leading Arm and the Magellanic Stream indicating the position of the Large Magellanic Cloud (LMC), the Small Magellanic Cloud (SMC) and the quasars used for this study with at the bottom their filtered light’s spectrums showing traces of oxygen (O) and hydrogen (H). This information put together allowed to read the chemical “signatures” of the gas, its composition and its speed. From all this, the researchers deduced that the gas comes from the Small Magellanic Cloud and was torn from the Large Cloud. Arriving in the Milky Way, that gas can contribute to the formation of new stars. These are processes that can continue for very long times so the studies can procede in no hurry.